Frost is an awesome looking onepage and multipage WordPress theme with a unique portfolio which is suitable for artists, photographers, creative agencies, digital studios, personal freelancers, and any kind of business owners that would like to showcase their portfolio beautifully. 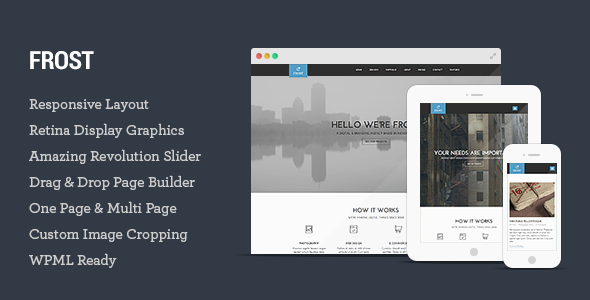 Item Reviewed: Frost Multipurpose One Page WordPress Theme 9 out of 10 based on 10 ratings. 9 user reviews.